Jackson is a Donkey. Donkeys are smaller than horses. They are pack animals. That means they carry burdens or loads on their backs. They can also carry people. 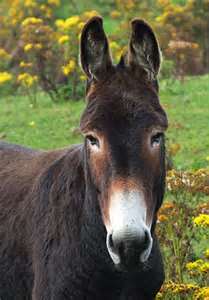 A male donkey is called a jack and a female a jenny. 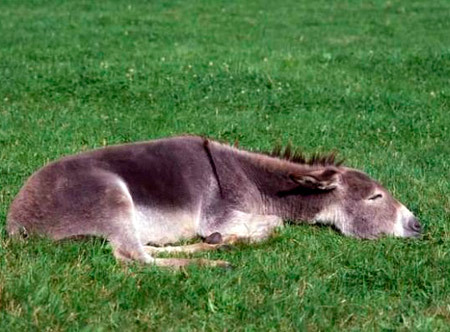 A young donkey is called a foal. Jackson was a stubborn donkey. Do you know what stubborn means? Stubborn means obstinate, ridged, unbending, uncompromising, pig headed, rigid, stiff necked, and unbending. People act stubborn when they want things done their way and will not do it any other way, even if there is a better way. 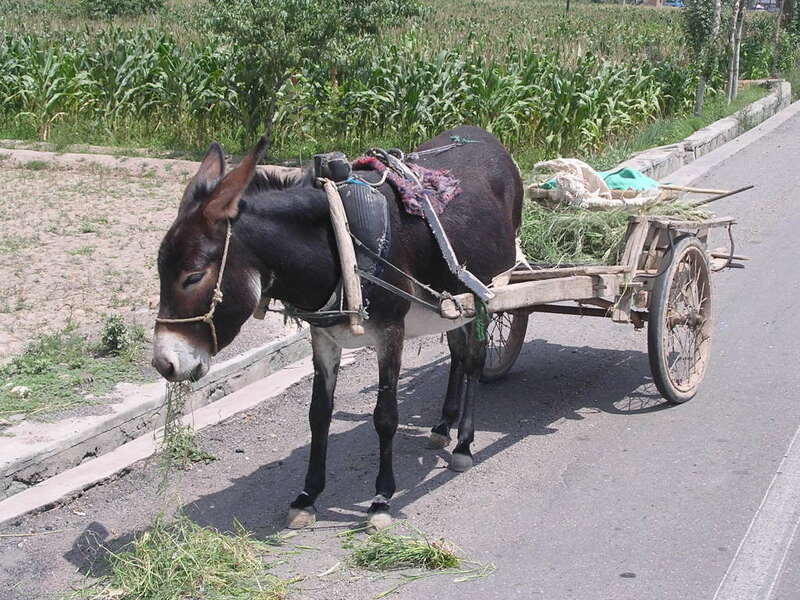 Most donkeys do pretty much what they are told to do but not Jackson. Jackson had many different owners because of the way he acted. His owners got tired of trying to get him to work, so they sold him to the highest bidder. Each time his owner put a load on his back, Jackson would shake back and forth until the load fell off before his owner could tie it on him. It took three people to get a load tied on him, and then he would not move. He always balked at walking up hill. He would straighten his front legs and try to sit down. Jackson had it in his mind that he didn’t want to work. He only wanted to lie around or eat. Our story starts with Jackson being sold again. His owner is fed up with him. His owner doesn’t care what becomes of Jackson. He just wants him gone. The center of the village is where people bring their animals and produce to be sold. It is the market place. Many animals are sold there: chickens, cows, pigs, donkeys, and the occasional horse. Jackson has never been to this village before. To get him there, his owner held a nice carrot in front of Jackson’s nose so Jackson would follow him. Jackson’s owner knew he would never get someone to buy Jackson in his own village, so they went two villages away. They stand in the market place, waiting for someone to come and look at Jackson. His owner hopes someone buys Jackson. Jackson is content to finally eat the carrot. Dora points at Jackson and answers, “Papa, I want that Donkey.” Dora pulls her papa by the hand over to the donkey she wants. Jackson eyes her and sniffs her hand. Jackson thinks she smells nice. Dora’s papa pays for Jackson and they lead Jackson home. Jackson was letting them lead him home because he was all out of grass to eat. Dora talks to Jackson all the way home to their farm. Jackson likes the sound of her voice. The next day, Dora’s papa tried many times to put a load on Jackson’s back. Jackson did what he always did and shook it off. Dora’s papa thought maybe Jackson was not used to the new surroundings so he waited two days before trying again. This time, he tried to attach a cart to Jackson so he could pull the load instead of carrying it on his back. Jackson kept stepping away from the cart. Finally after many tries, he was able to attach the cart to Jackson. No matter what Dora’s papa did, he could not get Jackson to pull the cart. Dora’s papa came into their home in a very frustrated mood. He said, “Dora, I wish I hadn’t listened to you and bought that stubborn donkey!” He then described what had happened. Dora went out to see Jackson. She spoke to him and patted him. She rubbed his nose and asked him why he was so stubborn. Jackson only looked at her. He liked the sound of her voice and the way she smelled. He liked how she rubbed his nose and patted his neck. No one had treated him that way before, and it was nice. Dora made it a habit of spending time with Jackson. One day, she put a small sack on his back and Jackson let her. He also let her walk him up a small hill. Jackson didn’t seem to mind to do it for her. Each time she tried, she was able to get larger and large loads on his back. Jackson did it for her, because he sensed she cared about him. She was kind and talked soothingly. Jackson liked Dora and Dora liked Jackson. Dora’s papa was amazed at how Jackson responded to her. Dora told her papa that she thought Jackson had not been treated kindly before, and he just needed love and tenderness. This is exactly what Jackson needed. He became one of the best donkeys they ever had. Every person in their family treated him nice, and he responded nicely back. He worked hard for every person in the family. Do you know someone who acts stubborn? Stubbornness is not an attractive or nice way to behave. We all could fall into a trap of stubbornness. We need to make sure we are open to new ideas or way of doing things.